A unique way to teach and learn languages using stories... and more! My school services include, amongst others, storytelling, regular teaching and continuing professional development. I can work with you to give you the skills you need to support your child's language learning. As I am an experienced speaker and presenter, you may want to talk to me about your event. Read my newsletter here and keep up-to-date with current events. The Mobile French Language Teacher. When you set up in the business world for the first time it takes time to find your path through the crowd'ed moshpit of businesses doing similar things and find your niche. My name is Nathalie Paris (I promise you, it is my real French name!) and after teaching full-time in secondary education for 19 years I decided to become self-employed : having enjoyed teaching languages for over 10 years in primary feeder schools I chose to focus on that (I currently teach in 3 schools) ; then in order to share my extensive collection of French books with others... the idea came about (it was my very good friend Carol's!) of putting them in a mobile library ! 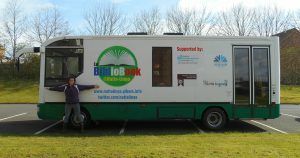 Please note : LE BIBLIOBOOK IS MUCH MORE THAN JUST A MOBILE LIBRARY !! The name Nattalingo was my son's idea: as I am called Nathalie, it is a play on words combining my name and the word lingo. Natha-lingo didn't read right so we changed the spelling!